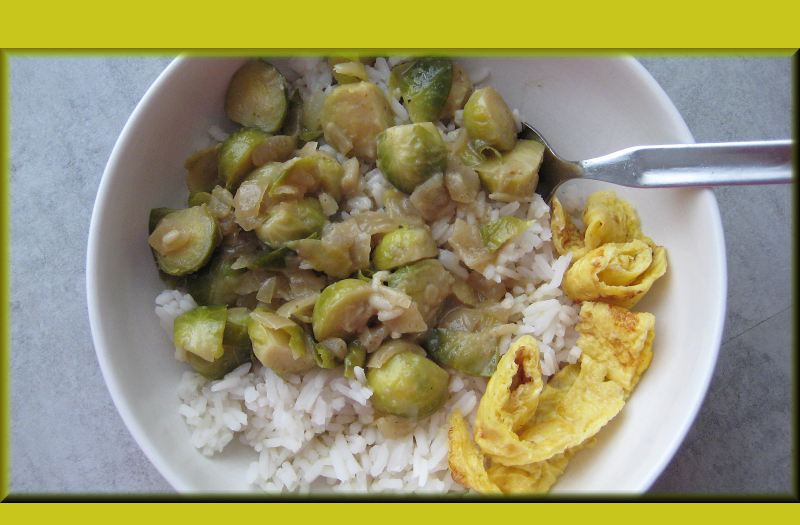 If you've been following this blog - you know that I've got a thing for Brussels sprouts. We never ate them when I was a kid, probably because my Dad got it in his head that they are yucky. But he's totally wrong! And actually I think a lot of people got that idea in their heads... it's just not true. They are really good. I've tried them several ways and I like them everytime. This particular recipe was a new and different way to eat them... and guess what? They taste even better the next day! Clean the vegetables. Finely chopped the onions and garlic. Cut the sprouts in half. Fry the onion and garlic together with the curry paste in the oil till the paste is fragrant. Add in the sprouts and coconut milk and 100 ml water. Let this cook gently for 8-10 minutes. Meanwhile, gently beat the eggs together with the milk. Add salt and pepper to taste if you like. Fry in hot margarine 3-4 omelets. Roll the omelets and then cut into spiral strips. Bring the curry to taste with soy sauce, lemon juice and coriander. Serve over steamed rice together with the omelets sprirals. I always combine it with low-fat bacon. And after I cooked them, I try to roast the sprouts in a pan. That sounds really good... i love bacon, too. Ooops! I forgot, I am your newest follower . Belgian Day - Speculoos Hagel and Stoemp!